For years, whenever the conversation turned to municipal courses in the region that were worth trying, somebody would invariably mention Ed Oliver GC in Wilmington. But it was usually late in the conversation. Which is to say that "Porky" Oliver’s, as I had always heard it referred to, didn’t seem to be on many people’s must-play list. That’s why I never quite got around to making it down there -- until recently. Why now? Because in the 15 months since the City of Wilmington brought in Billy Casper Golf to manage the facility, Ed Oliver GC (any reference to "Porky’s" has scrubbed from the website and the new marketing campaign) has been undergoing a general sprucing up and renovation, thanks to Casper’s committment of more than $1 million in capital improvements. In the 4,000-square-foot clubhouse, there is fresh paint and new carpet throughout, and the kitchen has refurbished. Interior walls have been knocked down to open up the place, creating two banquet/wedding rooms and a spacious grill room called the Greenhill Pub, which leads out to a new wrap-around deck overlooking the golf course. On the golf course, a bunker renovation project was about halfway completed before the winter-from-hell brought that to a temporary halt. A tree-pruning project is also ongoing, and there is new tee and yardage markers and new ball washers on every hole. There’s also fleet of 75 new golf carts. 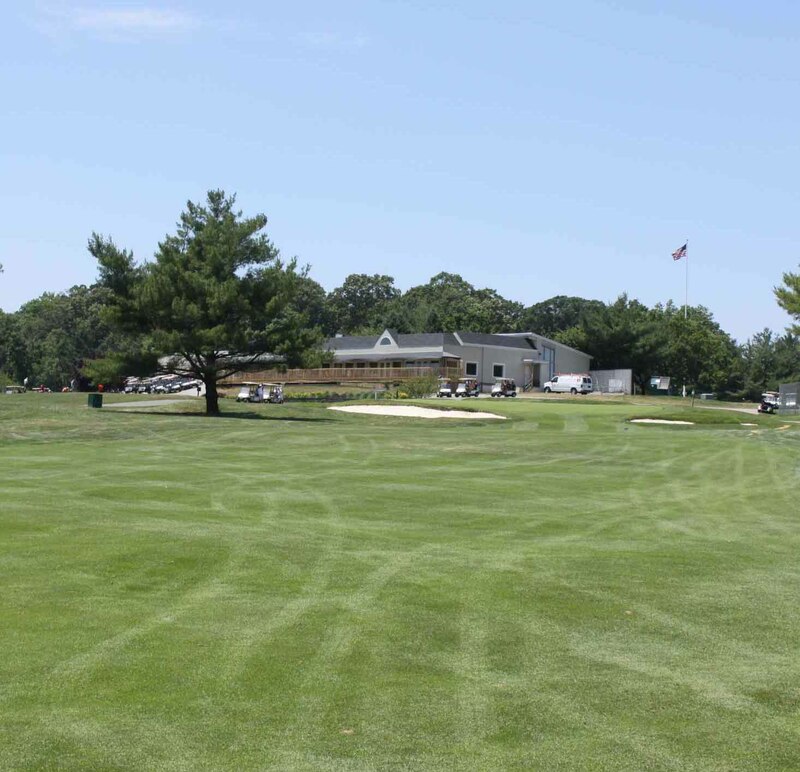 Most noticable, overall course conditions have been improved under superintendent JC Clevenger, who was imported from Cobbs Creek GC in Philadelphia, another Casper–managed property. "We are incredibly proud of the changes to Ed Oliver Golf Club," Karen Duncan, general manager, said a few weeks ago when Casper showd off the upgrades during an open house. Even with the facelift, Ed Oliver has the unmistakable look and feel of a working man’s muny – unpretentious and proud of it, proof that golf in this country has not been totally ceded to the private clubs with their parking lots full of BMWs and Mercedes. And busy. Did I mention busy? When a golf course is teeming with golfers on a hot, muggy weekday morning, as Ed Oliver’s was the day I was there, they must be doing something right. While it’s a muny these days, Ed Oliver’s pedigree is pure private upper crust, Wilmington-style. Opened in 1901, and said to have been designed by Englishman Wilfred Reid, the facility was the original Wilmington Country Club, built by the DuPont family as a haven for company executives. That explains why Ed Oliver’s is in the heart of Westover Hills, one of Wilmington’s oldest and swankiest nieghborhoods. In 1958, after Wilmington CC moved to its current location on Kennett Pike, the DuPont family donated most of the original property – 15 holes worth -- to the City of Wilmington as a park. The next year, the DuPonts donated 15 adjacent acres, enough to create three more golf holes. Much like Philadelphia munys, Ed Oliver went through good times and bad over the years, until the lease expired in 2008 and the course was closed. Soon after, Billy Casper Golf was called into the rescue. Also much like the Philadelphia munys, Ed Oliver has its moments as a golf course, with some fun and challenging holes. But ultimately it belongs in the category of "basic golf." In 2009, Golf Digest readers voted it in "Best Municipal Course" Delaware, awarding it an absurdly generous 4½ out of a possible 5 stars, ranking it ahead of the nearby and clearly superior Deerfield Golf & Tennis Club, another former country club now owned by the state. None of this is meant to denigrate Ed Oliver’s, because it does a fine job of being what it aspires to be, and it offers an enjoyable round of golf at a reasonable price. Primetime weekend green fees rates top out at $44 with cart, and there are plenty of special rates for twilight, juniors and seniors. At 6,115 yards from the tips, with a rating/slope of 68.8/124, it is a par 69 layout that is not overly difficult. (Here’s a hole-by-hole description.) Ed Oliver is plenty of course for the mid- to high-handicapper, juniors, seniors and many women, which constitutes a huge swath of the golfing public; but only occassionally will it get the low handicapper juiced. A parkland layout, with mostly tree-lined fairways and a minimum of hills, it is ideal for the golfer who prefers to sling their bag over their shoulder and get a little exercise. There is only one par 5 on the course, rather than the more conventional four, which accounts for the relative short overall length of the course. For the most part, the par 4s aren’t long, either; only three measure 400 yards or more. The best holes tend to be the short, dogleg par 4s. Ed Oliver opens with a couple of benign par 4s, but they are followed by two of the strongest and longest par 4s on the course: the 447-yard No. 3, with its sloping fairway and elevated green, and No. 4, 452-yard a slight dogleg, where I hit driver and hybrid and was still 20 yards short of the green. No. 5, the first par 3 on the course and the longest at 210 yards, has been accorded praise, or at least respect, in other reviews I’ve read, but it didn’t do much for me: long, straight, flat fairway, slightly tiered green flanked by two shallow bunkers. The other par 4 of note on the front nine is the 8th, a 388-yard dogleg that flows slightly downhill to a smallish green, also flanked by bunkers. The back nine has more personality and panache, beginning with No. 11, a 380-yard dogleg with an angled tee shot over a pond, and a green that is tucked into the side of a small hill. The 12th is a short (290 yards) uphill dogleg left, with trees in play on the right and left off the tee, and a green that is protected by a nasty, yawning bunker on the left. What makes the 143-yard par 3 13th interesting is that the front of the green is obscured from the tee, and getting up-and-down from greenside is no easy feat. The course concludes with another notable par 4: a sweeping, 400-yard dogleg right that eases its way to a slightly elevated green tucked behind two bunkers. It is also in the elbow of the dogleg on the 18th that you will find the ancient stone chimney featured in the Ed Oliver GC logo, a remnant from an old homestead. I played Ed Oliver ten yeras ago. Don’t remember much about it but I knew I wouldn’t return. White Clay, Deerfield, Rock Manor, 3 Bakers are my Delaware courses. A good course for locals. Yes, Deerfield is a better course. I would travel an hour to play Deerfield but wouldn’t to play Ed Oliver GC.